In order to reach and involve a new public and specific target groups, and to keep the threshold of the exhibition programme low for a broad public, the Kunsthal regularly organises extra activities in the exhibition spaces, the Auditorium and the KunsthalLAB as well as outside the Kunsthal. This programming is done in collaboration with parties in the city and elsewhere, with young talent and established names, and contains cross-overs between different disciplines. Among the special activities organised in the field of talent development and added depth in 2015 were the Artist Talks, family programmes and guided tours. The Kunsthal building functioned as a cultural and social meeting place and platform for third parties, with the emphasis on participation. On Friday 6 February West Den Haag organised the debate ‘Me against Us’ in the Auditorium of the Kunsthal. The debate was chaired by Lokaal director Liesbeth Levy in connection with the social criticism in the work of the video artist Bjørn Melhus. The debate was organised during Art Rotterdam in connection with ‘The Theory of Freedom’ in the Kunsthal, the International Film Festival Rotterdam and West Den Haag. ‘CJP Serves’ was hosted in the Kunsthal on 7 May. The large solo exhibition ‘Your Light is My Life’ by the Czech artist Krištof Kintera was the focal point of the evening. Participants in CJP Serves were plunged into Kintera’s world during a guided tour of these weird, moving works of art. Afterwards the founders of the satirical online news magazine De Speld talked about their vision of society. The exhibitions in the Freaky Spring brought a new and also younger public to the Kunsthal. 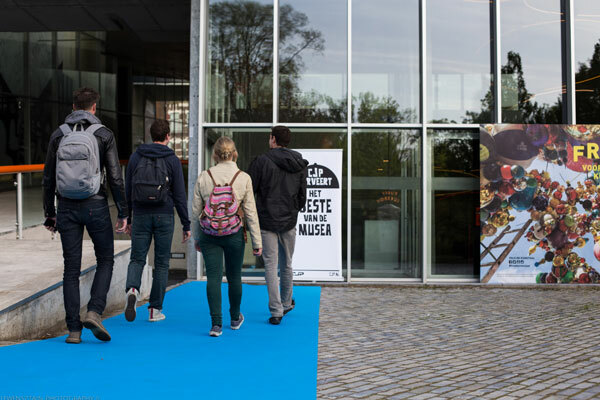 During the Freaky Weekend on 18 and 19 April, at the start of the National Museum Week, there were free mini-tours of the exhibitions, performances by Codarts circus students, a lecture by Charlotte Lybeer, and an Artist Talk with Kunsthal Light artist Thera Clazing. It was also possible to take part in an SKVR workshop and a theatre workshop inspired by the work of Krištof Kintera, to print a T-shirt à la Parra, and to juggle with guidance from Circus Rotjeknor. There was music by the instant composing duo Stephanie Francke and Friso van Wijk and the young singer/songwriter Tim Verhaal. The public could also sample Freaky Food at all hours in the Kunsthal café. In June the Kunsthal joined in the first edition of the Rotterdam Roof Days, the first opportunity for the public to take to the roof of the Kunsthal, to discover the swarms of bees, and to enjoy the view and the unusual architecture. The exhibition of scale models ‘150 scale models by students TU Delft’ presented the result of an intensive scale model workshop in the Auditorium in collaboration with the Architecture Faculty of the Delft University of Technology. The sketch models of the Kunsthal – made in just one day – showed 150 different interpretations of Rem Koolhaas’ iconic building from 1992. The workshop was preceded by thorough documentation, lectures and an excursion to the Kunsthal. The public could admire the result in the Kunsthal throughout the summer. On 3 September the architect Rem Koolhaas was present in person in the Kunsthal for an interview in an Auditorium packed to full capacity in connection with the first ten years of OMA. 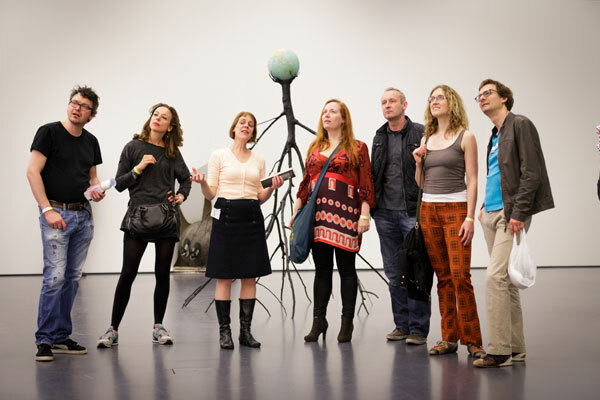 The extensive Kunsthal family programme is centred on active participation. To make this programme a success, the Kunsthal cooperates with various partners such as Codarts, ROC Albeda College, the Rotterdam foundation Proefhof, SKVR, and partners for specific exhibitions. 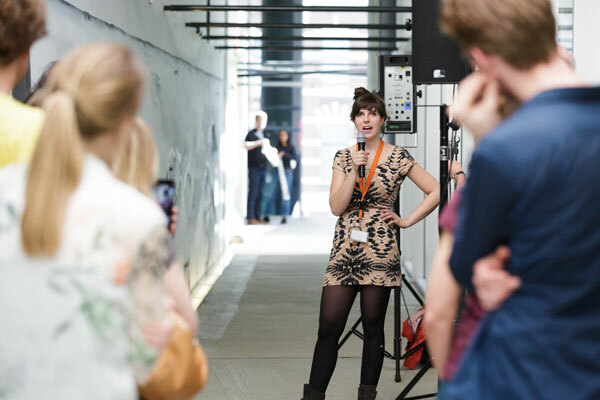 The open platform function of the Kunsthal offers students from various disciplines the opportunity to gain experience with the public. 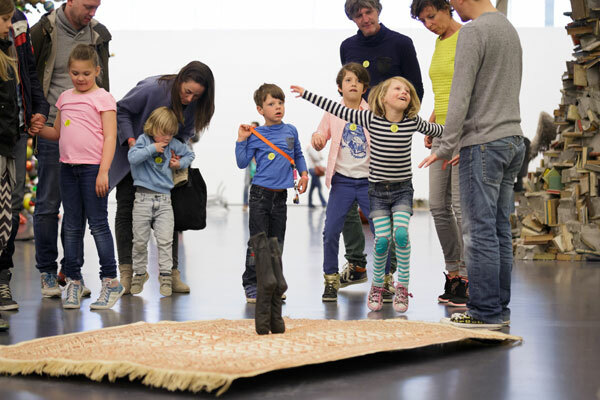 On the Kunsthal Family Day on Sunday 19 April, families were introduced to the highly accessible installations of Krištof Kintera during the Freaky Weekend. There were dance workshops for toddlers and infants, illustrator Marieke van Ditshuizen read from her book ‘My bath is flying’, and everyone could take part in theatre workshops or make his or her own colourful work of art à la Krištof Kintera with recycled material. 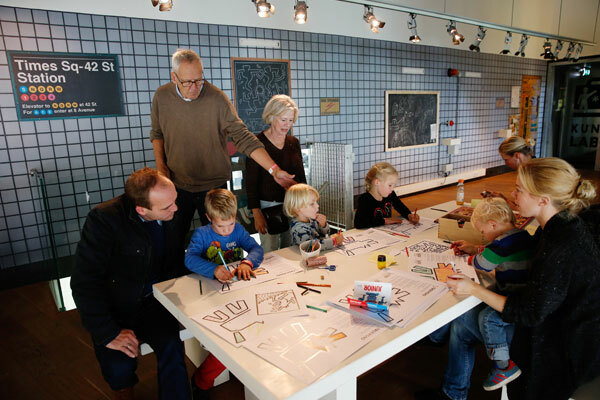 On Family Day 11 October, during the Keith Haring Weekend, families took part in special family guided tours in which young people talked about their fascination with Keith Haring. Young breakdancers from the Hiphophuis gave workshops and demonstrations and DJ Git Hyper from DemonFuzz-Records provided the authentic Eighties sound. Children could make their own protest poster with artists from OPPERCLAES. There were continuous activities in the KunsthalLAB, from drawing, doing puzzles, cutting out dogs on a string or making flip books to Keith Haring-style metro drawings. You could learn all the tricks of the Rubik’s Cube from speed cuber Ron van Bruchem. 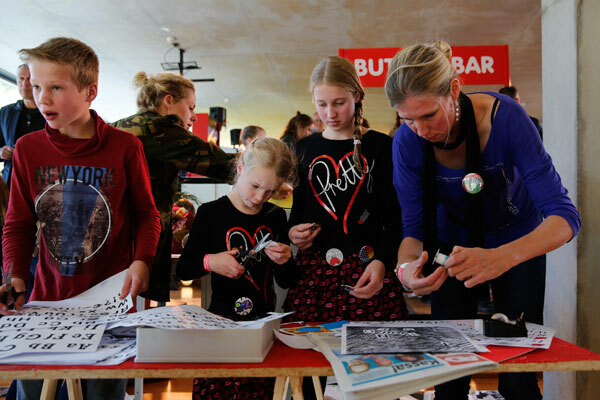 A popular activity for young and old was to make badges at the Superduo badge bar, a symbol of the Eighties mixed with the contemporary visual culture. More than 1,000 visitors left the Kunsthal that day wearing the badge they had made themselves. Last but not least, the Kinki Kappers Pop Up Barbershop gave Eighties haircuts a contemporary look for anyone bold enough to take a seat. 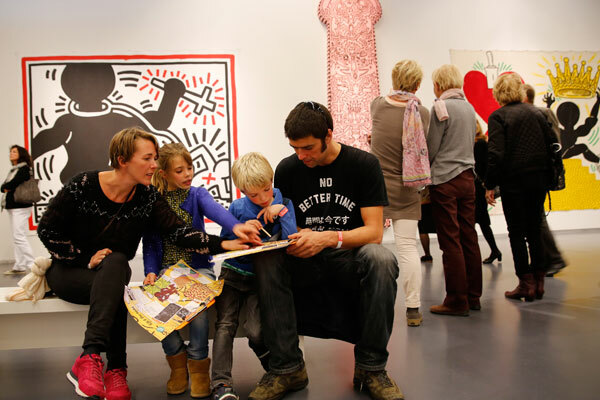 The Keith Haring Weekend attracted more than 5,000 visitors. During weekends and school holidays the focus was on extra activities for families, such as special family guided tours, workshops and music and theatre performances. 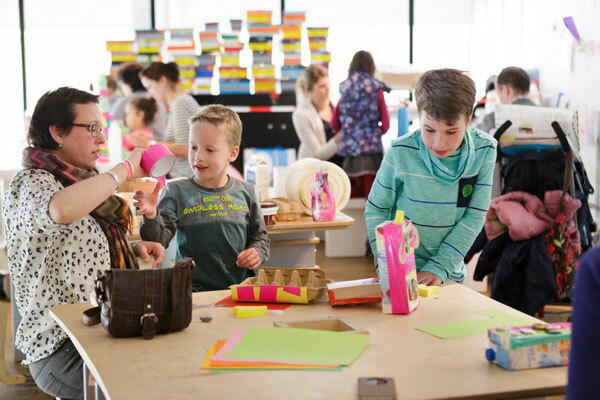 Children started to make their own children’s book or a Russian Roly Poly doll in the KunsthalLAB, and families could visit the exhibitions with one of the Look & Do tours for different age groups. The KunsthalLAB is the permanent educational space where children from the age of 4 years and adults can actively participate in a combination of learning, entertainment and social interaction. An estimated 40,000 visitors came to the KunsthalLAB in 2015 and more than 1,200 school pupils followed workshops on school outings. This all makes the KunsthalLAB the ideal basis for school groups, children and adults to be able to take part in activities every day. 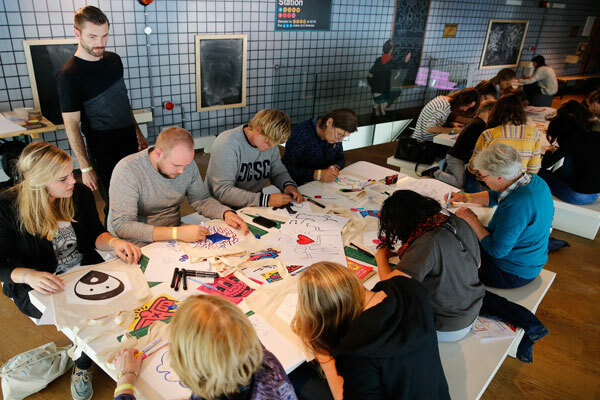 During the Krištof Kintera exhibition, children could dress up and make a freaky creation that could then be seen on the screen in the Kunsthal café. During the Keith Haring exhibition the KunsthalLAB was transformed into Times Square subway station in the atmosphere of Haring’s subway drawings. The KunsthalLAB was intensively used during Cultural Trajectory workshops and during the school holidays. Prior to the exhibition ‘Keith Haring. 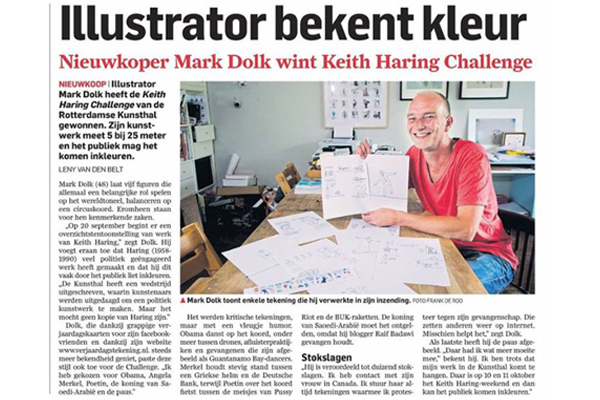 The Political Line’, the Kunsthal invited graphic designers, artists, muralists, illustrators, street artists, designers and cartoonists to draw inspiration from the artist Keith Haring and from the title of the exhibition ‘The Political Line’. More than 55 submissions were assessed by the jury: Julia Gruen, director of the Keith Haring Foundation in New York, artists Jan Rothuizen and Piet Parra, and Kunsthal director Emily Ansenk. The designs of the three prize-winning artists and illustrators were implemented. Their creations were painted by passers-by and visitors on a canvas several metres long during Lowlands in August, 24 uur cultuur in the Rotterdam Central Station in September, and during the Keith Haring Weekend in the Museumpark Rotterdam in October. The Kunsthal continually stakes on life long learning and supports this with additional activities for adults. 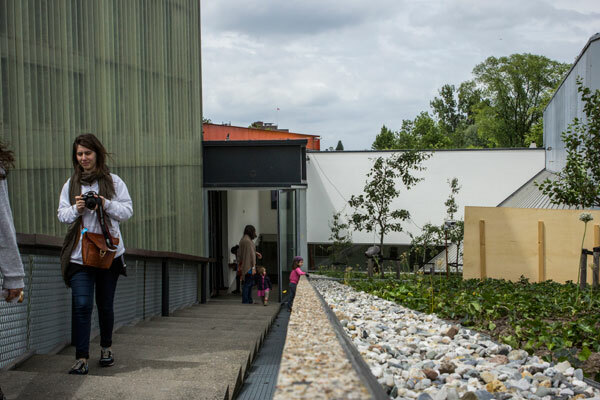 The Urban Guides team, with which the Kunsthal has been cooperating since 2014 to offer guided tours, showed 7,040 visitors round the various exhibitions last year. An extra dimension is added to the exhibitions for adults by lectures, audio tours, a weekly film programme in the Auditorium and Artist Talks. One of the many examples was the double interview with Julia Gruen, director of the Keith Haring Foundation New York, and Dr Dieter Buchhart, guest curator of ‘Keith Haring. The Political Line’, during the opening weekend of the exhibition.